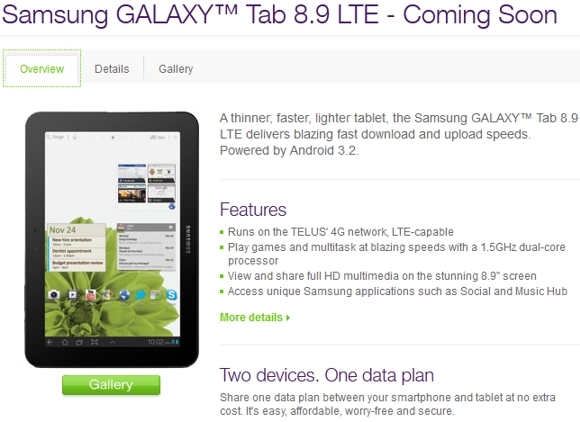 Samsung Galaxy Tab 8.9 LTe has just listed on official website of Telus Canada. This tablet is marked as coming soon. As you know Bell is already offering this LTE tablet for $429.95 in Canada but soon you will be able to grab it from Telus as well. The launch of this tablet is delayed by the carrier since it has to launch the LTE network next year. You can check this tablet here. Samsung Galaxy Tab 8.9 is running on Android 3.2 Honeycomb operating system which will surely get an upgrade of Ice Cream Sandwich from Google. There is a stylish 8.9 inch display on board which can boosts up the resolution of 1280×800 pixels. For connectivity purpose, it not only supports fastest LTE network but also GPS and Wi-Fi. On front side you will find a 2MP front facing snapper while on the back it has a 3MP rear camera. It is powered by a 1.5GHz dual-core processor which is complemented with 1GB RAM.Check full specs of Galaxy Tab 8.9 here. Now we have to see when Telus will start taking the order of Samsung Galaxy TAB 8.9 LTE from Canadian tablet users. Currently, Telus didn’t mention the price but surely it will be same as of Bell Canada i.e. $429.95 with a new 3-yr contract.